Having missed out on a decent session last week when a couple of my mates had some decent fish up to 7lb,the other morning I decided to try myself. It was still dark, the tide was well out and the sea was flat as a pancake when I got to the coast. 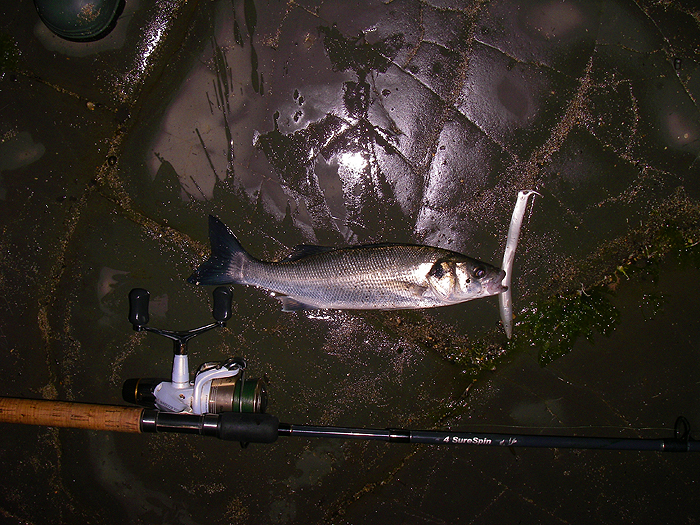 After a bit of a hike I began spinning with an 18cm Redgill and, typically, just as it began to brighten I had a bite and landed a schoolie. In the following half-hour three more followed, none bigger than the first but I was reasonably pleased to have caught something. Four fish in not much more than an hour is reasonable action. 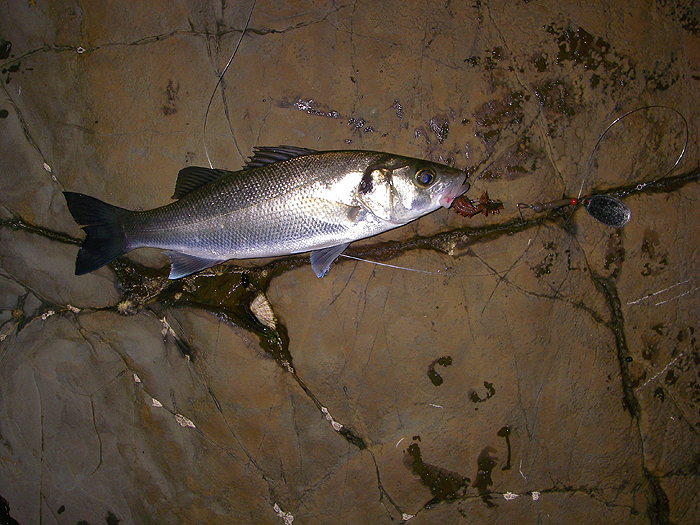 On my walk back I noticed lots of mullet feeding on billions of Idotea in a small bay. I filed the information away for the future. A couple of days later and the weather, for once, was actually improving. Rob and I arranged to go spinning in a local tide race. When we got there, at 04:00hr - disaster - someone had beaten us to it. Not wanting to push in (there's not much room to fish) we quickly decided on a change of venue. The only down side was that I'd left my fly rod at home and had to spin. 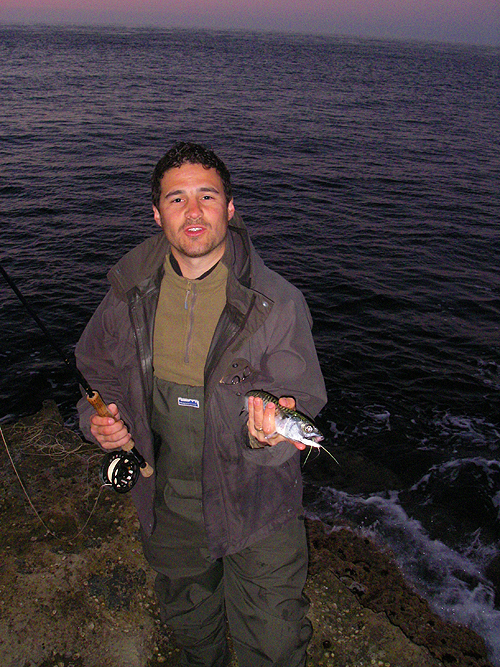 Rob, however, was better organised and was able to fly fish. It was still pretty gloomy when we began to fish and apart from the odd knock on my Redgill, at first nothing happened. There wasn't much water so I switched to a shallow running Fakebait and suddenly I was into a nice mackerel. A good start but apart from pollack knocks I had nothing else. Rob, using his home made streamer fly began to make up for his slow start. 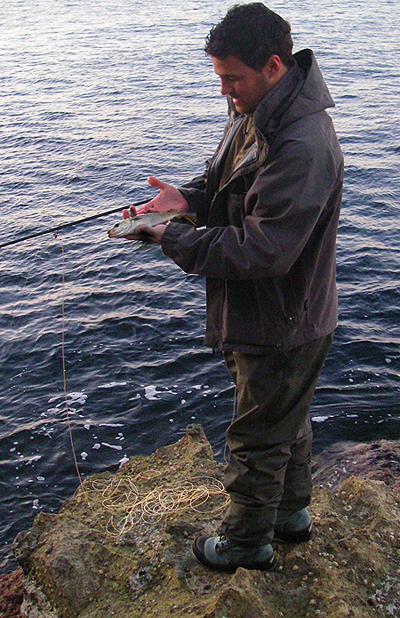 His first pollack, a nice one, dropped off at his feet then he had a mackerel - his first ever on the fly - followed by more pollack. A very pleasant trip altogether. I still had in mind the Idotea spot so the next day, armed with a dozen ragworm and my spinning rod, I went to see if I could tempt a thick-lip. The tide was rock bottom when I got to the spot and I could only see tiny fish. Since it was still pretty dark I started off with a J9 Rapala, winding slowly to keep it above the masses of rotting weed. I had a few tiny knocks but couldn't hook anything. When the sky began to brighten I changed to a small mullet spoon, baited up with ragworm and began to spin. After about five minutes I was into a bass but it was very small. Clearly that was what had been troubling my plug earlier. Anyway, that was that. Despite fishing on for another twenty minutes I could get nothing else. Not a sniff of a mullet (although I'm sure, from the bow waves, that there were a few in front of me). I'm away for few days now so better luck next time.